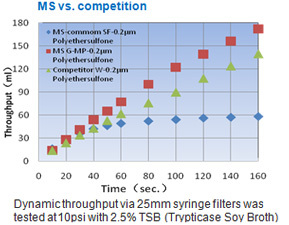 MS® G-MP syringe filters are designed specially to filter high particulate solutions. With four layers, the first filter is a composite membrane of 10μm glass fiber and 1.0μm PP, the second prefilter is 0.7μm GF/F membrane media, the last one is filtration media as specified. G-MP special membrane materials can eliminate sample contamination and allows you to filter difficult samples with less hand pressure and fast flow rate. They prevent the build up of back pressure typically caused by the blocking of an unprotected membrane.